The musical tribute honoring my husband, Dan, was a successful event surpassing all my expectations. Jed Appelrouth, my son, stepped into his dad’s shoes as emcee at the December benefit for Temima High School for Girls. He charmed the audience as he shared his love for his father and showed his willingness to honor Dan’s memory with commentary and song. If Dan had been there, he would have been as proud as I was. The Beethoven sonata played on the grand piano by Rabbi Menashe Goldberger was complex and left most of the audience in awe that the rabbi had memorized the 15-minute piece. The klezmer music and jazz delighted the audience. Attending the tribute are (from left) Michelle Appelrouth Seltzer, Rabbi David Appelrouth, Arlene Appelrouth and Jed Appelrouth. 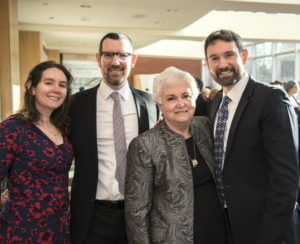 I gave a speech about the curious 20-year relationship Dan and I have with Temima and its headmistress, Miriam Feldman. I also read an original poem about coping with the challenges of widowhood. People couldn’t hold back their tears as the afternoon progressed. I think the videos brought on the avalanche of emotions. The first video contained photos from Dan’s entire life. From Key West to the Navy to Atlanta, people saw Dan as a baby, a bar mitzvah and a groom, as well as all that his life, and my life with him, contained. The second video showcased his 35-year musical career in Atlanta venues. Ella Szczupak, a videographer and owner of Blue Orchid Productions, did an amazing job. She was Dan’s videographer for years. She would not accept any money for putting the videos together, which took a lot of time. The event’s musicians, Judy Cole and Al Kneiter, also donated their time. In the past, Dan hired them to accompany him as he sang. Watching videos of Dan was like being emotionally ambushed. There he was, on a big screen, singing his heart out as Tevye from “Fiddler on the Roof.” He put on a black cap and sang “If I Were a Rich Man” at every concert. 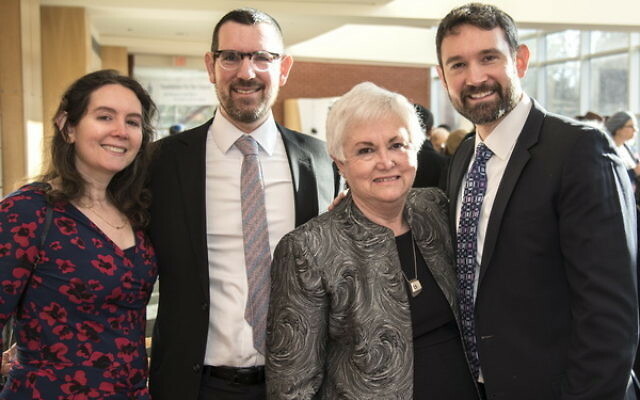 The recording filled the Atlanta Jewish Academy auditorium, and as the videos showed Dan singing over 35 years, it was hard to imagine that a man so filled with passion, who loved his life so much, was no longer here. From the front row, I heard people crying all around me. My son David, who flew in from Canada for the event, joined Jed to sing “My Way,” which they had sung onstage with Dan. Dan and I have always loved music. It was important that we pass on this love to our three children and make sure they had opportunities to develop their musical abilities. They all had piano lessons. David also had saxophone lessons. We took them to the symphony and the opera. All three, Michelle, Jed and David, sang in high school. All learned to experience the joy of music. I sat feeling proud as Jed and David sang Dan’s signature songs. L’dor vador went through my head, but I couldn’t stop the tears as I wished Dan were onstage with them. My daughter was sitting next to me. I was grateful to have all three of my adult children together. It doesn’t happen often enough. The show was coming to an end, and the last song was the one everyone associated with Dan. The words to “If I Were a Rich Man” were printed in the program, and everyone was invited to sing along with Jed and David. When Jed and David started singing, along with a video of Dan as big as life, something happened in that auditorium. Jed and David each put on one of Dan’s black Tevye caps. David looks so much like Dan, and Jed’s gestures resemble Dan’s. They sang while images of Dan flashed on the screen. There were so many tears, it was as if everyone suffered an emotional ambush. People have told me that Dan was a legend. He had a reputation as someone who lived to give. He was a real community guy. A friend sitting behind me tapped me on the shoulder as the program ended. I know being a saint has a Christian connotation. I asked my son David, who is a rabbi, what the Jewish equivalent of a saint is. I don’t know if my husband was a tzaddik. I know he was a great husband and a fantastic father, and he gave his heart to whatever he did. I appreciate the Goldbergers for their choice to honor the man I loved. It shows that his life really was a blessing.